For needle disposal. 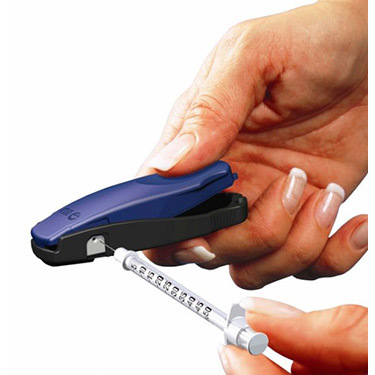 Safely clips and stores up to a two-year supply of insulin syringe needles. Simple clipping action snips off and retains needles within clipper. Meets government regulations on proper method of in-home insulin syringe disposal. Compact portable and locks closed for storage and travel. Can be used with 28G - 31G needles and 3/16" (5mm) - 1/2" (12.7mm) length needles. Not intended for use with lancets.